The parable of the talents is found in Matthew 25. Many of us have read it, studied it, and maybe even taught it. Did you know that the parable is talking about us today? This week Chris breaks down the parable and we’ll learn how we need to look at the slaves and talents and reflect in our own lives and what God has given us to steward. We will learn that this is more than simply about money. The talents represent unique gifts that have been given to you. Are you using those talents to further the Gospel or are you burying them and keeping those gifts from others? It’s a question we should be asking ourselves and our fellow brothers and sisters in Christ regularly. Chris Katulka: Instead, what Jesus is communicating to the disciples and to us today is that the stewardship of what has been given to us matters. And since stewardship involves different amounts entrusted to the disciples, the talents probably represent a personal gift or abilities, the gifts that have been given to you. What are you doing with the gifts to advance the gospel of Christ? Steve Conover: When Jesus spoke to the disciples in the Gospels, he wanted to make sure they were prepared for his departure. He was letting them know at some point he would leave them to go sit at the right hand of the Father, and that he expected them to take his message to the world using the God-given gifts and abilities given to them. This is the Friends of Israel Today. I'm Steve Conover. Chris Katulka: And I'm Chris Katulka. Today on the program, we're going to open up to Matthew chapter 25, the Parable of the Talents, where Jesus was communicating the story of his departure and return. But that while he is gone, he expects his disciples to use their gifts and abilities to advance his gospel. You know what's so amazing is that the message given to the disciples 2,000 years ago is a message for us today, his disciples today. We've been called to take our gifts and our abilities and invest them in making Christ known so that in the end we can show our master, the increase of these investments in the kingdom of God. Steve Conover: We look forward to that Chris. In the news, John Cheney-Lippold, a professor of cultural studies at the University of Michigan refused to write one of his students a letter of recommendation to study abroad in Israel, pledging his support to an academic boycott against the Jewish state. Professor Cheney-Lippold emailed his eager student, "As you may know, many university departments have pledged an academic boycott against Israel in support of Palestinians living in Palestine." The boycott includes writing letters of recommendations to Israeli universities. Chris Katulka: This is just a continuation of the boycott, divestment and sanctions that are happening in universities, happening in organizations around the world and even in companies. Well, here's my take. I wonder if Professor Cheney-Lippold would refuse to write letters of recommendations for students who wish to study in Lebanon, Syria or even Jordan. These countries truly abuse Palestinians. Refusing to give them citizenship, keeping them caged up in refugee camps and even systematically starving them. Israel has done more to protect, preserve and promote the Palestinians than any Muslim nations that surround them. I think Professor Cheney-Lippold and his academic friends should do what they get paid to do, study. Study where the real Palestinian suffering is originating. And I think quickly they will find out Israel isn't the problem. I've been traveling a bunch lately speaking at our national prophecy conferences. We had our Winona Lake conference in the summer of course in Winona Lake, Indiana at Grace College & Seminary. And then we did it all over again in Lancaster, Pennsylvania earlier in September and we just wrapped up our national conference in Winnipeg, Canada here at the end of September and it's been such a blessing. And not only did I have a chance to speak but I also had an opportunity to hear from some of our amazing teachers. We all taught through the Olivet Discourse, Jesus's prophecies from the Mount of Olives that can be found in Matthew 24 and 25. There was one passage that really stuck out to me as we were going through the conference this year and that's the Parable of the Talents. It's only a few verses so I'm just going to take some time to read it. Remember, a parable is a story that Jesus gives to communicate a theological message that he wants us to understand, a biblical message that he wants us to understand. And so this starts in Matthew 25:14. Listen to this. "For it is like a man going on a journey, who summoned his slaves and entrusted his property to them. To one, he gave five talents, to another, two and to another, one. Each according to his ability and then he, the master, went on his journey. "Therefore, take the talent from him and give it to the one who has 10. For the one who has been given more, he will have more than enough. But the one who does not have, even what he has will be taken from him and throw that worthless slave into the outer darkness where there will be weeping and gnashing of teeth." That's Matthew 25:14-30, the Parable of the Talent. And the Parable of the Talent is all about the now. This age that we live in today and how the now affects what's coming in the future. And notice how the parable is built. The master is with his slaves, his servants. The word slave is a difficult one to understand. We're not talking about slavery from the American history, European history. We're talking about a servant, a bondservant. Someone who actually would sell himself into service so that he'd have a place to live and a place to sleep and food on the table. So when we're talking about a master and a slave here, we're talking about a master and a bondservant. We don't really say bondservant anymore. When I say slave, I don't want you to go back to the concept of American slavery. We're talking about someone who willingly wants to serve his master. And so the master's with his slave and entrust them with money to invest and he does this because notice he's going on a journey, he's going away. But then the land owner returns. The master here is pictured to be Jesus, and Jesus is telling the disciples, I'm going away but I'm coming back. So this whole parable is centered around the fact that Jesus is first coming, he's departure to go be with the Father and then his return, that's the big umbrella picture here. Now let's look at the slaves, the servants here, the servants of the master. They're entrusted with a lot of money. The talents during the days of Jesus were worth 6,000 denarii. Think about this. One denarii was the equivalent of a day's wage during the days of Jesus. So the master leaves his servants with a large amount of money to invest. One commentary said the way that Jesus uses the word talent in his day is the way that we would use the word million in our age. So notice what he says here. He says, to the one he gave five talents, to another he gave two and to another he gave one, each according to his ability and then he went off on his journey. See, to the one God entrusts his most prized possession, he gives something even more. Remember, the servants were the ones that the master had entrusted his property to and now he's giving them something even more, something to invest. There's a theologian named Ehrlich Lutz who writes this, "The large monetary unit of the talent reminds the members of the church today that they have received great things from Christ." Now the master gives different allotments of money to invest to three different servants. To the one, of course, who has the most ability, the one that he trusts the most he gives a lot of money, five talents. Matthew says that the servant given five talents went to work and turned that 5 talents into 10 talents. Notice, it almost sounds like he does it right away, he got to work. For the other servant, he gave two talents and in the same manner, that servant went out and turned that two talents into four talents. The master knew what they were capable of doing and they each turned a profit for the master. However, that last servant who clearly already had a reputation with the master. Remember, Jesus said to each was given according to their ability. Now, what that last servant did with that one talent given to him was different from the rest. He hid the talent, he hid the money. He decided that it would be better to simply bury it, to do nothing with the money and just sit on it. He thought that would be better. There's nothing to be gained in this way. He's not going to lose the money, it's in a safe place but at the same time, nothing's going to be gained from it. Now, as Jesus is applying this parable to the lives of the disciples who are listening, and to us 2,000 years later. Jesus isn't communicating the issue that's really at stake is money. Money's not what Jesus is talking about here. Instead, what Jesus is communicating to the disciples and to us today is that the stewardship of what has been given to us matters. And since stewardship involves different amounts entrusted to the disciples, the talents probably represent a personal gift or abilities, the gifts that have been given to you. What are you doing with the gifts to advance and the talents that you have to advance the gospel of Christ? Are you taking those gifts and ability and those talents using them to bless other people to point to the Lord, as a result having a multiplying effect? Or are you taking those god-given gifts and abilities ... And I love that we can use the word talents even though talents in Jesus's mind in the parable here is related to money. In English, a talent is a gift, an ability. Are you taking those things that God has given to you naturally and are you just sitting on them? Have you buried them? I love what Paul says in the beginning of Romans 12:3. He says this, "For by the grace given to me, I say to every one of you not to think more highly of yourself than you ought to think, but to think with a sober mind as God has distributed to each of you a measure of faith." And he goes on into verse 6, he says this, "And we have different gifts according to the grace given to us. If the gift is prophecy, that individual must use it in proportion to his faith. If it is service, he must serve. If it is teaching, he must teach. Folks, we have all been given gifts. How are you stewarding those gifts? Do you know what those gifts are? I think it's really important to know your spiritual gift because the master is coming back and he's going to judge those who invested their gift into the kingdom of God. And then he's going to also judge those who just simply sat on it. Listen to what the master says to the two servants who used the resources he gave to his servants. Remember, he says, well done good and faithful slave. You have been faithful with few things but I will put you in charge of many things. Enter into the joy of your master. Enter into the joy of your master is just another way of saying this, good job, you have shown that you can be trusted with the gifts that have been given to you. Welcome into the kingdom of God. It's a prophecy. Welcome into the kingdom. You have been faithful to what God has given to you. But on the other hand, the servant who buried his talent gets a much different response. And when we return, we're going to look at what made this foolish lazy servant bury the gift that was given to him by his master. Steve Conover: Sometimes it's hard to place yourself in the world of the New Testament. As you enter the time and place of Jesus and His disciples, it's really easy to put Western thinking and life on the pages of Scripture. In the times of Jesus, there are confusing practices. New people, groups and even unexplained religious conflicts. How did it all come about? Well, Dr. William Marty walks you through the history leading up to the arrival of Jesus in the book, The World of Jesus. Get to know the times in which Jesus lived so you'll better understand his teaching and ministry, and along the way, discover how God prepared the world for the one who would turn it upside down. To learn how you can purchase The World of Jesus for a limited time, go to foiradio.org or call our listener line at 888-343-6940. That's 888-343-6940 or once again, foiradio.org. Chris Katulka: Welcome back everyone. We've been discussing the Parable of the Talents from Matthew 25 and we just learned that the parable is all about how we steward the God-given gifts, ability and talents to impact this world for the sake of the gospel. While Jesus is away, the question we need to be asking ourselves is this, how are we using the resources he's given to us to minister to people and to point them to him? Well, we just saw that when the master returns, which is the equivalent of Christ returning, the master is pleased with the two servants who invested their talents and turned it into a profit. But on the other hand, the master has some choice words for the servant who chose to bury the talent that was given to him. Listen to the exchange between the master and the lazy servant. "Then the one who had received the one talent came and said, 'Sir I knew that you were a hard man, harvesting where you did not sow, gathering where you did not scatter seed, so I was afraid. And I went and hid your talent in the ground. But see, you have what's yours.' But his master answered, 'Evil and lazy slave. So you knew that I harvest where I did not sow and gather where I did not scatter, then you should have deposited the money with bankers and on my return I would have received the money back with interest. Therefore, take the talent from him and give it to the one who has 10.'" There is one phrase that just sticks out to me about this servant who didn't invest the master's talent, and it all has to do with the way he viewed the master. Listen to what he says, "Sir, I knew that you were a hard man, harvesting where you did not sow and gathering where you did not scatter seed, so I was afraid and I hid your talent in the ground." Folks, that last servant feared the master and had a wrong perception of the master. He feared the master and thought he had unreasonable expectations. If the master is Christ in the parable, it's safe to say that this servant who buried his talent didn't know the master. He didn't know Christ. Christ doesn't come off in that manner where he's hard and has unreasonable expectations. Instead, we know from the scriptures that Christ is merciful, kind and loving, forgiving and faithful. And when we understand Christ from that perspective, it doesn't tie us up and bring us into a world of fear where we don't want to serve him at all. No, it actually frees us when we know that we serve a master who is merciful, kind, loving, forgiving and faithful. Friends, fear can be debilitating, can prevent us from fulfilling the God-given purpose placed in our life. Especially, when we have a wrong understanding of who Jesus is. God doesn't want us to cower toward him. In Christ, instead, he wants us to serve Him with confidence. Using the gifts he's given us to glorify Him and to multiply the resources that he's blessed us with. Steve Conover: Now, Apples of Gold. A dramatic reading from the life and ministry of Holocaust survivor Zvi Kalisher. Mike Kellogg: I was recently asked to visit a very sick elderly man whose son is my friend. I arrived in the final hours of his life. He told me he had been a drunk all his life. "Now that I have reached the end of my life," he said, "I realize I have never known satisfaction. Not from things, people or even my children. I have been bad and drank far too much. I never even thought about my family and now God will not give my voice if I call on him." I told him, "No, my friend, that is not so. Every cloud has a silver lining and you can have a silver lining because even now at the end of your life, you can be saved." "Can I be saved after everything I have done." "Yes." I answered. "The Lord our Savior gave himself for us so that we can have everlasting life." He asked if this was really true. I told him it was indeed true and I read Isaiah 53:6, "All we like sheep have gone astray." I then said, "The passage from our own Hebrew Scriptures is meant for everyone who comes to the Lord even if that happens at the very end of your life. All you must do is trust in him." John 3:16 says, "For God so loved the world that He gave His only begotten Son that whosoever believes in Him should not perish but have everlasting life." Surprisingly, this man became peaceful and quiet. And when his son came into the room he asked, "What have you done to my father that he is so quiet and says he is happy?" When his father related everything he had heard and told this son he believed it, the son was displeased. I told him it is my duty and the duty of every believer to tell others the truth in their time of need. We are responsible to each other. "How can you be responsible for my father? You're not a member of this family." I replied, "We have one Father in heaven. As members of his family, we have a responsibility to one another. Are you against your father having such peace from the Lord in his final hours?" "No." The son replied. "But I am against you because you spoke with him about a faith he never heard about all through his life." "That is exactly the point." I said. "Even though he had not heard before how to have true faith in the Lord, the Lord will still receive him and your father is happy because he is no longer lost. You will all have to stand before the Lord one day just as your father will do very soon. He has heard the truth about Jesus Christ and has gladly received him. He is now happy in the Lord and you and your family can share his last moments with him in happiness." I pray they will accept the Lord soon before they are on their death beds in a lost and hopeless condition. Chris Katulka: The impact of Zvi's life and ministry in Israel continues to inspire. Zvi's ministry in Israel lives on through his family today and has encouraged many of our Friends of Israel workers around the world to continue ministering to the Jewish community. When you give to the Friends of Israel, your donation allows us to advance the gospel of our Messiah Jesus. You can give by going to foiradio.org and click on our donate link. Also, let us know where your listening when you contact us. Steve Conover: We sure would love to hear from you and we thank you for joining us today. Chris you shared with us your insights into the parable of the talents. Any thoughts as we close? Chris Katulka: Yeah. The biggest issue that comes up with the Parable of the Talents is that third servant and his understanding of who the master was. He had a misunderstanding of who he was. He feared him. And you know what, misunderstanding fear can change the way that we serve God. God doesn't want us to fear him so much that we don't serve Him, but he wants us to understand that he's compassionate, loving, kind and gracious. And when we really know who God is, when we really understand him, it frees us to serve Him and to take the gifts and abilities that we have and invest in the kingdom of God. Steve Conover: The Friends of Israel Gospel Ministry has been sharing the love of the Messiah and supporting Israel and the Jewish people since 1938. You can financially support the Friends of Israel Today Radio ministry, visit foiradio.org. That's foiradio.org or call our listener line at 888-343-6940. Again, that's 888-343-6940. Write to us at FOI Radio, P.O. Box 914, Bellmawr, New Jersey, 08099. And as Chris mentioned, let us know where you're listening when you call or write. Our host and teacher is Chris Katulka. Today's program was produced by Tom Gallione, co-written by Sarah Fern, Mike Kellogg read Apples of Gold. Our theme music was composed and performed by Jeremy Strong. I'm Steve Conover, Executive Producer. The Friends of Israel Today is a production of the Friends of Israel Gospel Ministry. We are a worldwide Christian ministry communicating biblical truth about Israel and the Messiah while fostering solidarity with the Jewish people. Sometimes it’s hard to place yourself in the world of the New Testament. As you enter the time and place of Jesus and His disciples, it’s easy to put western thinking and life on the pages of Scripture. In Jesus’ time, there are confusing practices, new people groups, and even unexplained religious conflicts. How did it all come about? 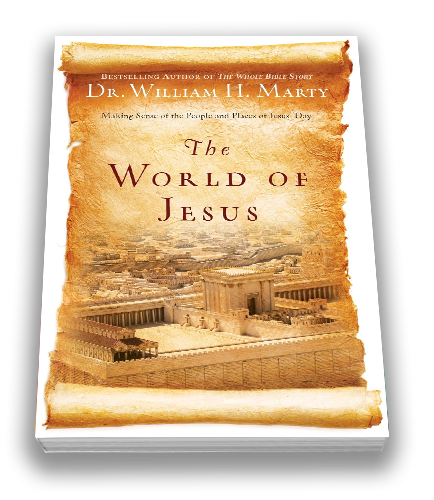 Dr. William Marty walks you through the history leading up to the arrival of Jesus in the book The World of Jesus. Get to know the times in which Jesus lived, so you’ll better understand His teaching and ministry. And along the way, discover how God prepared the world for the One who would turn it upside down. Zvi was asked to visit an elderly man, a father of a friend. It was this man’s final hours on earth. He shared with Zvi that he was a drunkard and lived a selfish life. Zvi was able to share with this man about the good news of the Messiah. Hear what the news of faith did to this man and how his family responded.